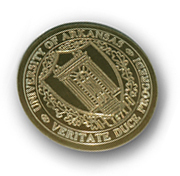 All topographic and planimetric surveys performed for the University of Arkansas in Fayetteville shall conform (at minimum) to U.S. National Map Accuracy Standards for maps larger than 1:20,000. Topographic surveys shall be performed on the ground and information gathered to generate accurate one-foot contours. All surveys are to be horizontally tied to at least two UA control monuments and vertically tied to at least one UA control monument. UA control monument information is available for download, below. Please contact planning@uark.edu with questions. Final surveys are to be drafted at an appropriate scale when viewed on a 11x17 to 24x36 size plot, but in any case shall not exceed 1”=100’. Final surveys are to be submitted on paper and on CD in an AutoCAD (.dwg) format.